Everybody knows that song about “chestnuts roasting on an open fire,” right? Well, if you have a special chestnut pan you really can roast them over an open fire. Your chestnut pan will have holes in the bottom and a long handle so that you can hold it over an open fire at a comfortable distance. Don’t have a chestnut pan? 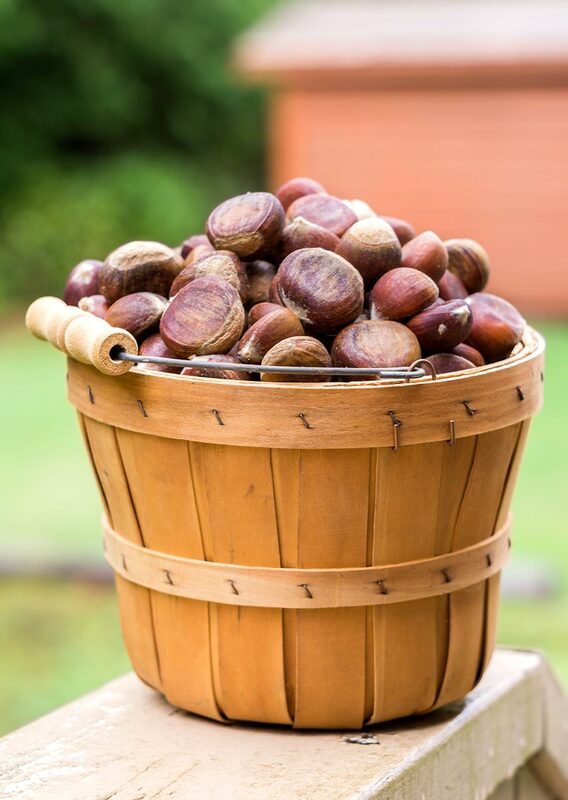 Not to worry – you can still easily and successfully roast fresh chestnuts, with no open fire required! There are literally thousands of interesting ways to prepare chestnuts, but roasting is one of the easiest and most satisfying ways to enjoy them. A roasted chestnut has an warm, inviting aroma, soft chewy texture and surprisingly sweet, nutty flavor. Roasting brings out the very best qualities of chestnuts, intensifying and concentrating their sweet, earthy flavor. 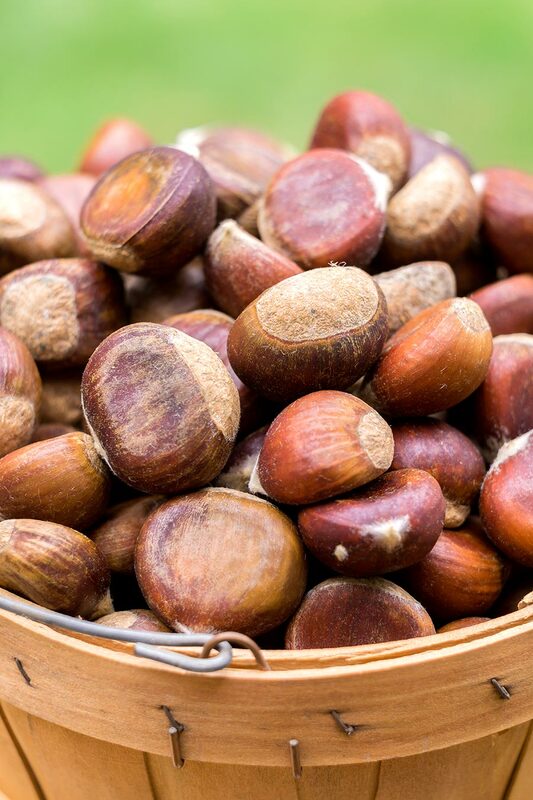 There is absolutely nothing finer than a handful of warm, freshly roasted chestnuts on a crisp, autumn evening. First, you need to pierce the outer shell to create a steam vent. If you don’t, the pressure from expanding steam inside the nut is likely to cause them to explode into a mealy mess as you’re roasting them. That’s no fun! 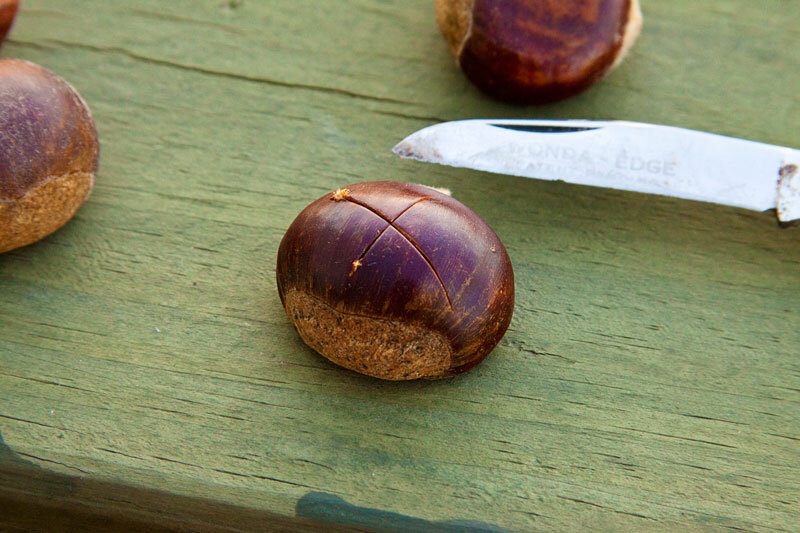 First, pierce each nut by making a slit or “X” with a small, sharp knife (a utility knife is perfect) either on the flat side of the nut, or on the pointed end. Slit the shell, but not the meat of the nut. 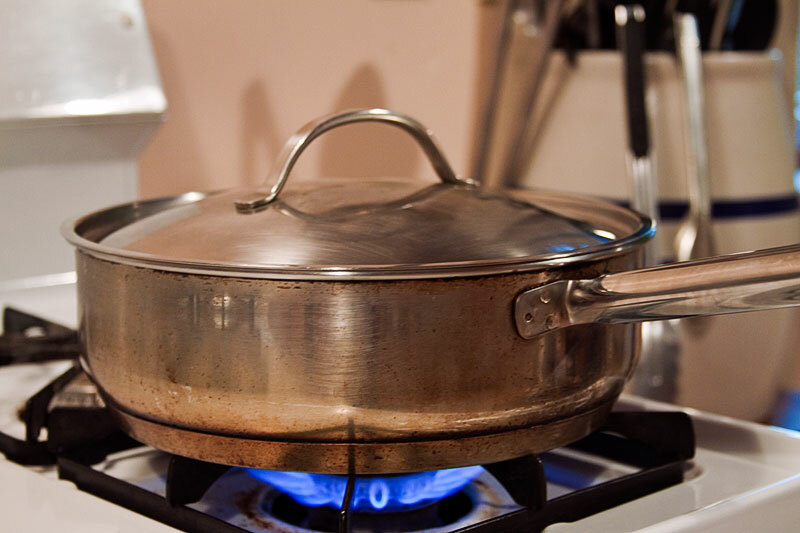 Place the scored nuts in a heavy dry skillet with a tightly fitting lid. Cook over medium heat, shaking frequently to prevent burning, for 15 – 30 minutes. The nuts are done when the shell darkens & scorches slightly and begins to curl away from the cut. The meat of the nut should be soft, it should smell sweet, and it should be translucent yellow in color. 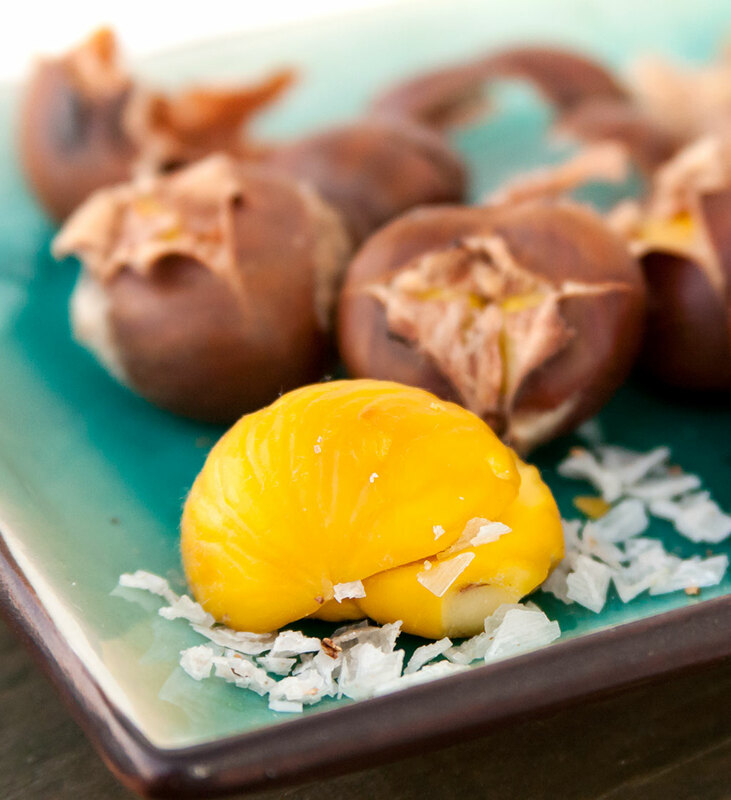 Quickly peel and eat the chestnuts while they’re still hot, popping them out of the shell and the papery brown husk or ‘pellicle’ which covers them. Work fast, because as soon as the chestnuts begin to cool, the pellicle becomes very difficult to remove. But hey – a couple of burned fingers are worth it, right? You can also roast fresh chestnuts in an oven. Simply spread them in a roasting pan with a tight fitting lid and bake in a pre-heated 400 F oven for around 30 minutes. Check from time to time, and when the shells begin to curl away, get ready to peel & eat! However you roast them, once they’re done, roasted chestnuts really need nothing more than a sprinkling of sea salt to be at their simple best. Peel them while they’re piping hot, enjoying the heat and toasty aroma, the moist crumbly texture and the sweet, mild flavor. Are all chestnuts edible? I know of a few chestnut trees in my area and and have always wondered if the nut they produced was edible. Thank you!